It might at first glance look like an older model, but this is the brand-new Porsche 911 Targa. Aficionados of the brand will no doubt rejoice at the return of the classic styling as Targas from the 1990s and 2000s looked less distinctive and featured what was essentially a large glass sunroof, but for 2014 the 911 has gone back to its roots. The original Targa predated the 911 Cabriolet and offered wind-in-the-hair fun with a removable roof panel over the front passengers and a distinctive domed rear window behind. This latest Targa has a novel twist on the theme. Whereas owners of the original 911 Targa had to manually remove and stow the fabric panel over the driver and front-seat passenger, this latest version has an electrically-operated action providing 19 seconds of pure street theatre. At the press of a button the roof fabric begins to retract into a Z-shape, while the curving rear window flips upwards, allowing the roof to nestle behind the 911’s token rear seats. Once in place the rear windscreen lowers back into place, clasping against the contrasting colour Targa roll hoop. It suits those who want to enjoy fresh air motoring but appreciate the Coupe’s resistance to the weather extremes Britain has suffered in recent years. Two versions of the 911 Targa will be available, both with a choice of conventional manual or PDK double-clutch automatic transmissions, and all have four-wheel-drive. The Targa 4 packs a 3.4-litre 345bhp engine in the rear, sprinting to 62mph in 4.8 seconds when fitted with the PDK gearbox and optional Sport Chrono Package. With the same set of optional extras, the 3.8-litre Targa 4S with 394bhp manages the same acceleration test in 4.4 seconds before achieving a top speed of 184mph. Despite the performance on offer, Porsche has ensured no versions of the 911 Targa fall into the costliest VED tax band with CO2 emissions for the range being between 204g/km and 237g/km. Similarly fuel consumption isn’t wallet-crippling either with up to 32.5mpg average claimed for the Targa 4 with PDK transmission. Although the 911 Targa’s half-coupe, half-cabriolet nature implies it’ll be priced in smack bang in the middle of the hard- and soft-top 911s, it’s actually just a few hundred pounds cheaper than the 911 Cabriolet Carrera 4. On reflection this is no great surprise considering that roof arrangement aside, the Targa is mechanically closer to the Cabriolet than the Coupe. 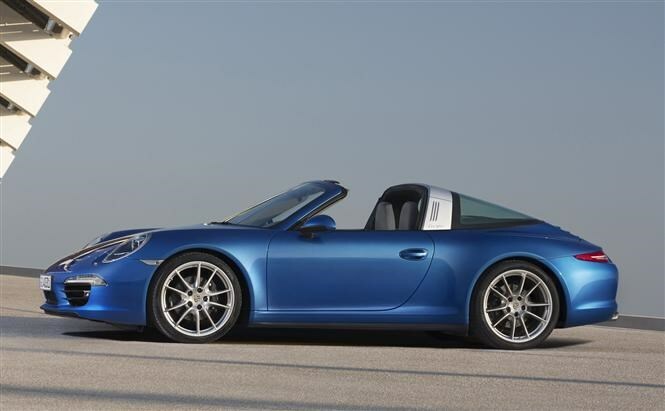 Porsche’s new 911 Targa is available to order now with first deliveries reaching the UK in May 2014. Check back well before then to read the detailed Parkers new Porsche 911 Targa review and find out if this modern reworking of an old theme has the desirability of the original.